Microleakage has been discussed as a major contributing factor for inflammatory reactions at the implant-abutment connection. In previous studies, the tightness against corpuscular bodies (viable bacteria) has been successfully investigated under static and dynamic conditions. The aim of this study was to investigate the tightness against endotoxins of two implant systems (AstraTech and Ankylos) with conical internal connections under static conditions. The inner parts of eight implants of each system were inoculated with endotoxin. 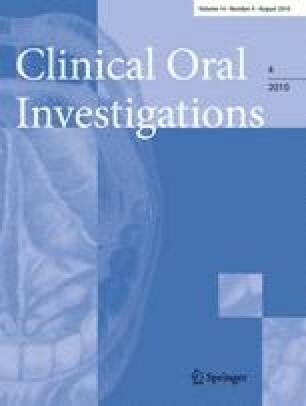 Implants were screwed together with the respective abutments and stored under isostatic conditions in a supernatant of pyrogen-free water for 168 h. Supernatant samples were taken after 5 min, 24 h, 72 h, and 168 h, and endotoxin contamination was determined by the amebocyte-lysate test. Only one implant in the AstraTech group showed no sign of endotoxin contamination after 168 h, while the other implants showed contamination after varying storage times, respectively. The implants in the Ankylos group showed endotoxin contamination after only 5 min of storage in the supernatant solution. The tested internal conical implant-abutment connections appear to be unable to prevent endotoxin leakage. In average, Astra implants showed a higher tightness than Ankylos implants. The authors gratefully acknowledge the laboratory assistance kindly provided by Gisela Otto (Department of Oral and Maxillofacial Surgery, School of Dentistry, University Hospital Schleswig-Holstein, Kiel, Germany) and Jeanette Oberli for her great support in manuscript preparation. This project was supported by a grant from the German Association for Oral Implantology (Deutsche Gesellschaft für Implantologie).